What a great day! The township does a nice job getting the kids prepared for Kindergarten. Upon enrolling students you sign up for a bus trip which they run for almost two weeks in May. 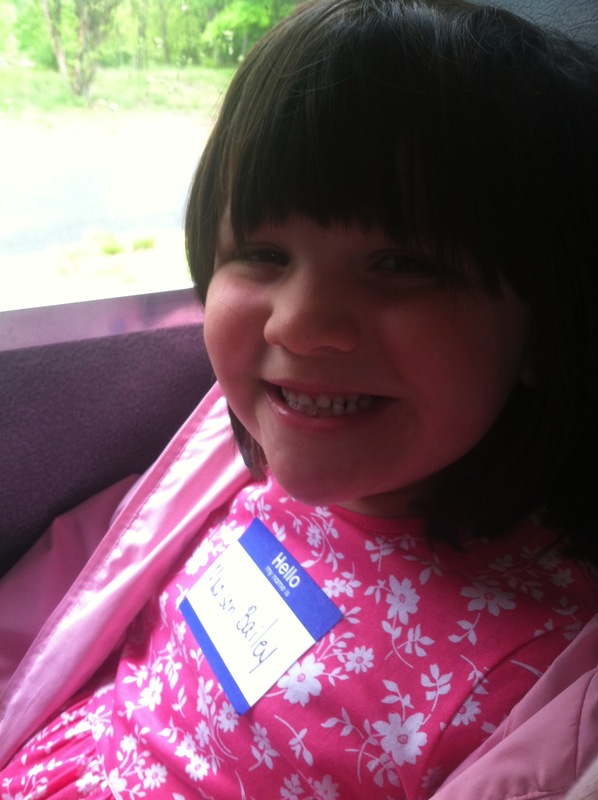 You get to ride the bus with your child to school to help ease them into it. After getting Megan onto the bus for school, Madison and I headed off to the park for our tour. I was not thrilled with the pouring rain outside thinking that we would have to stand in the park after checking in to wait for the bus. I was very pleased when we tuned the corner into the lot and saw the bus there waiting for us…YEAH! As soon as Madi saw it she started yelling at me that we needed to hurry or we would miss it. (mind you we were 15 minutes early) We boarded and our adventure was underway. The actual ride to the school is only maybe 5 minutes but to the kids it is like a magic bus heading to an entire new world. I do not have great memories of school from my youth. Was not a great student early on..lets just say I had some issues. I have two little girls who just love school so I do everything I can to keep this going! We arrived and interestingly the rain stopped long enough for us to get into the buildings..then the skies opened. We met with the special teachers (art,library,music and gym) and they all did a 5 min presentation/interaction with the kids. All very nice. Then we toured the buildings. We ran into Megan’s old teacher who made a big production over meeting Madison..who just loves attention! Madi thought she was the coolest thing that they already knew her in this school. Heading back to the bus Madison confidently stated “I can’t wait to come, I am going to like it here”. Oh..and no I did not cry! I wish I could get through a day without thoughts of the pending mastectomy. As we sat with the teachers of course the kids were a bit nervous and quiet. The librarian was having them imagine happy things; running in the park, sitting in the sun on the beach and fireworks on the 4th of July. I thought about my 4th of July..I will be 2 days post op lying in the hospital and hoping for no fireworks! Thankfully I was able to shake it off for the most park and took my baby to the mall for lunch and shoe shopping. All in all another great day!